Cysticercosis epidemiology in Spain: What’s new? Cysticercosis, an infection caused by larval cysts of a pork tapeworm, is a leading cause of seizures and epilepsy in many parts of the world. Now, researchers writing in PLOS Neglected Tropical Diseases have for the first time assessed the impact of cysticercosis hospitalizations in Spain. 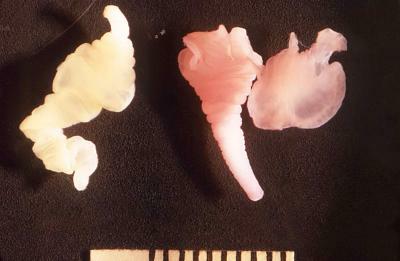 Cysticercosis is caused by larval cysts of the pork tapeworm Taenia solium and is common in pigs. It can affect humans when they ingest T. solium eggs through contaminated soil, water or food, or through person-to-person contact. Cysticercosis is considered the most frequent preventable cause of epilepsy worldwide. In Europe, cases have been growing more common over recent years due to travel and migratory movements from countries where the tapeworm is endemic. In Spain, there is no surveillance system in place for monitoring human cysticercosis. Dr. Zaida Herrador, of the Carlos III Health Institute in Spain, and colleagues retrospectively analyzed cases coded as cysticercosis from 1997 through 2014 in the Spanish Hospitalization Minimum Data Set. They calculated rates of hospitalization, determined common clinical characteristics, and studied trends over time in the 1,912 hospitalizations with cysticercosis. From 1998 to 2008, there were an increasing number of hospitalizations with cysticercosis, with a peak in 2008 and then declining rates through 2014. This data paralleled changes in the external migration rate to Spain. 7.6% of all clinical cysticercosis cases were in children under age 15. Overall, the 16 through 44 age group was the most represented and the most frequent associated diagnoses were epilepsy and convulsions, hydrocephalus, and encephalitis. The Murcia region had the highest hospitalization rate, 13.37 hospitalizations per 100,000 population, followed by Navarra and Madrid. "Despite the European Directive 2002/99/EC which recommends monitoring animal cysticercosis, according to the epidemiological situation, many countries do not report these cases, including Spain," the researchers say. "There is a need for a common strategy on data collection, monitoring and reporting, which would facilitate a more accurate picture on the cysticercosis epidemiological situation." Funding: The authors have received no specific funding for this work.